I’ve made a lot of King Arthur Flour recipes, and often there’s a special ingredient or flavoring that is noted as optional. I usually don’t have that ingredient, so I skip it and the recipe is still delicious. 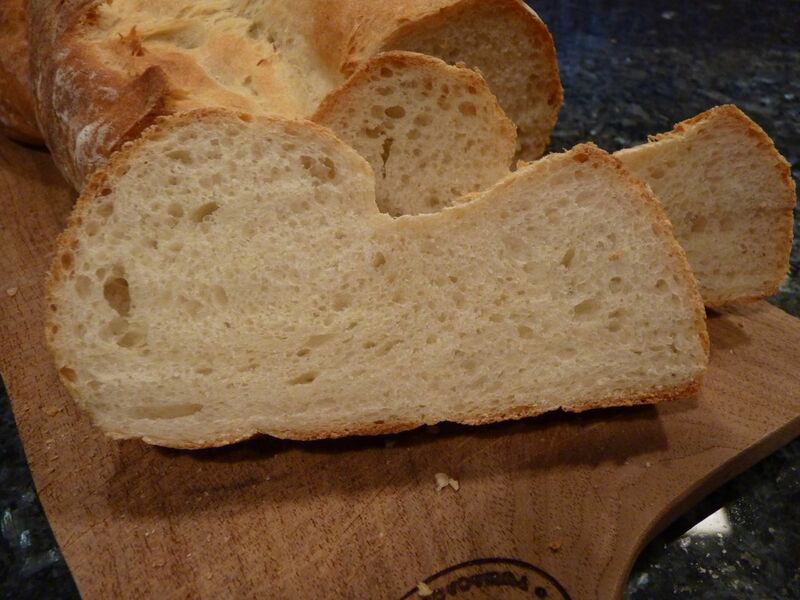 This recipe, which Michele told me about, uses King Arthur Flour’s Olive Artisan Bread Flavor, and not as an optional ingredient. The flavor mix includes flour with black olives, garlic, olive oil, rosemary, and oregano – all flavors that I like, so I ordered some to give it a try. And the verdict is…this is a tasty flatbread! The flavor mix, plus olive oil and salt on top, is delicious. I’ve made other similar recipes and have liked them all, so it’s not required to buy special ingredients to make this kind of bread. But it turned out great and I’m looking forward to trying the flavoring in other recipes. This flatbread takes a full cup of the flavor mix, but they recommend adding just 1/4 to 1/2 cup to other bread recipes. I plan to try it in pizza crust – why not have some olives in the crust as well as on top of the pizza? This is another recipe that Michele and I baked together (virtually speaking), and she posted about it today too, so be sure to check out her thoughts on the flatbread. If you want to give this a try, you can get the recipe here on King Arthur Flour’s site. Did you know that you can view their online recipes in Volume, Ounces, or Grams? I appreciate that feature every time I use a King Arthur Flour recipe! 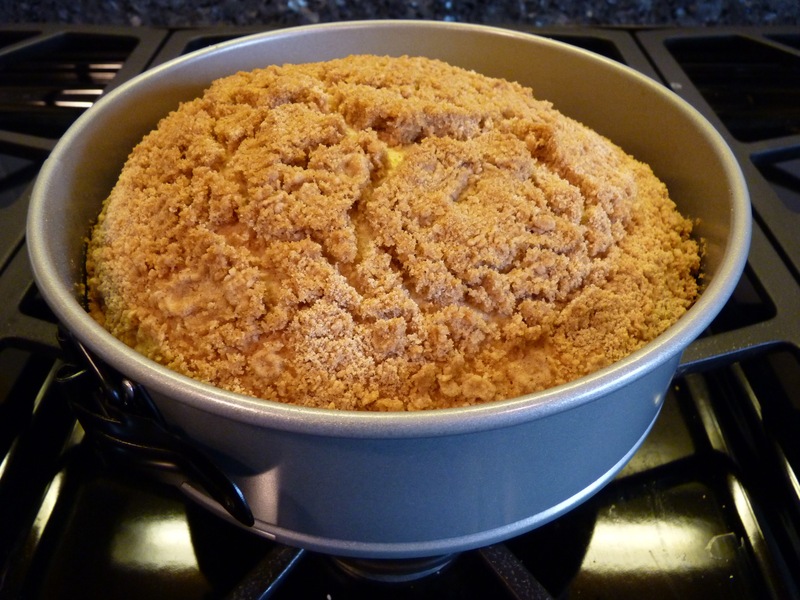 When I read King Arthur Flour’s blog post about this Cream-Filled Coffeecake, I was intrigued. The story behind the recipe involves a woman famous for making coffeecakes, and equally famous for not divulging the recipe. At her funeral, her family passed out the recipe. Mystery solved? Not quite – the recipe wasn’t very detailed, so one of the recipients of the recipe turned to King Arthur Flour for help. The revised recipe is now published on their site. 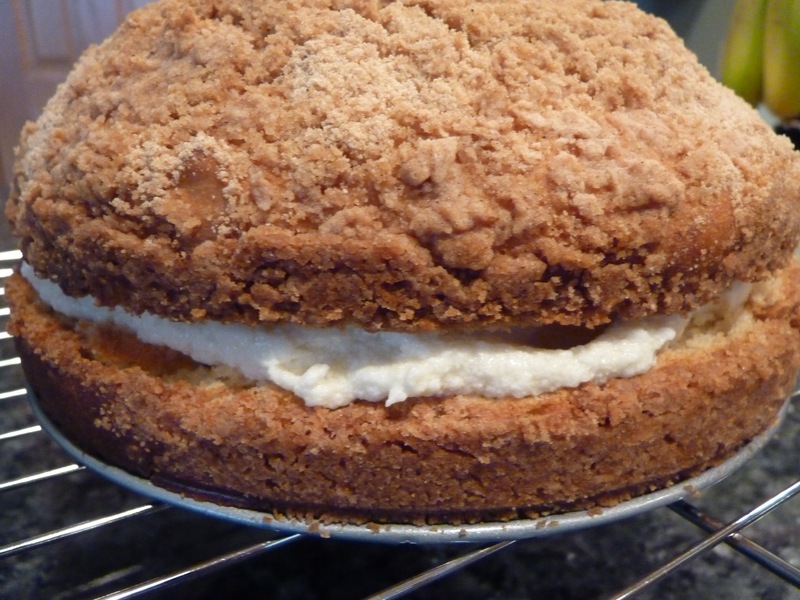 The interesting story, plus a taste for what I’d call an old-fashioned coffeecake, spurred me on to give this a try. I wondered if the cake part would be too bread-like, but it was light and airy and was complimented perfectly by the sweet topping and creamy, vanilla filling. As good as the filling was, I wanted more of it and would have liked it to be a bit more fluffy. I made this recipe along with my blogging friend Michele, who changed it up and made a different topping and filling. Be sure to check in with her blog, Veggie Num Nums, to see how hers turned out! The recipe is here on King Arthur Flour’s site. Don’t expect to make this in the morning and serve it for breakfast. The mixing, rising, resting, baking, and cooling all add up to quite a bit of time (not all of it hands-on). The total time on the recipe is up to 4 hours 15 minutes, but I think I spent at least 5 hours total, start to finish. It was at its best the afternoon of the day I made it. The next day, it was still tasty, but was dry. The recipe says it can be frozen, so next time I’d freeze it right away and then defrost right before eating (it should defrost pretty quickly). A whole recipe makes a huge cake with 20 servings. I made a half-size cake and baked it in an 8″ springform pan. It is very tall, so that’s still a good-sized cake. For a half-recipe, I made 1/2 the amount of dough and 3/4 the amount of topping and filling (proportions are in accordance with the recipe’s tip about making two smaller cakes – you need to increase the topping and filling amounts). Another recipe tip says to be gentle when combining the two parts of the filling. I ended up with some flour lumps, so I vigorously whisked it. The lumps were gone and I thought it looked fine. Watch the baking time. I baked my smaller cake for 35 minutes, and probably could have taken it out at 30. I’m a big fan of focaccia. I’ve made quite a few different recipes but this one might be the one. Could you say no to this wedge of deliciousness? It takes just moments to mix up the starter, which sits overnight. On baking day, there is some amount of tending to the dough between several short rises. Nothing complicated and it’s totally worth it. If you’re ready to get baking, you’ll find the recipe from Cook’s Illustrated here. I’m all about a seeded, grainy bread, and this Crunchy Seed Braid from King Arthur fit the bill better than I could have imagined. White whole wheat flour, rolled oats, and King Arthur’s Harvest Grains Blend give this bread lots of taste and texture. 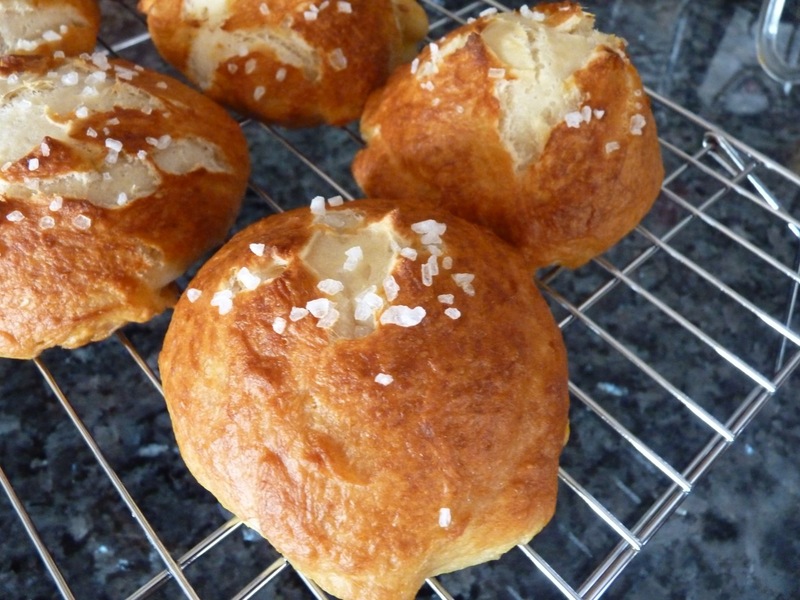 This was another virtual baking session with my friend Michele, who also gets credit for suggesting this recipe. Thanks Michele! This one is a keeper. Instead of mixed seeds, I used all sesame seeds on top, because a) That’s what I had on hand and b) I love sesame seeds. I have a bag of King Arthur’s Harvest Grains Blend, but if you don’t want to buy it, take a look at the ingredients – I bet you could mix up your own. Instead of using an egg wash to get the seeds to stick, I followed this method from King Arthur (but I rolled the dough to the length stated in the Crunchy Seed Braid recipe). It worked great! This baked and browned more quickly than the recipe stated. Keep an eye on it, and be ready to top it with a foil tent to keep it from over-browning. 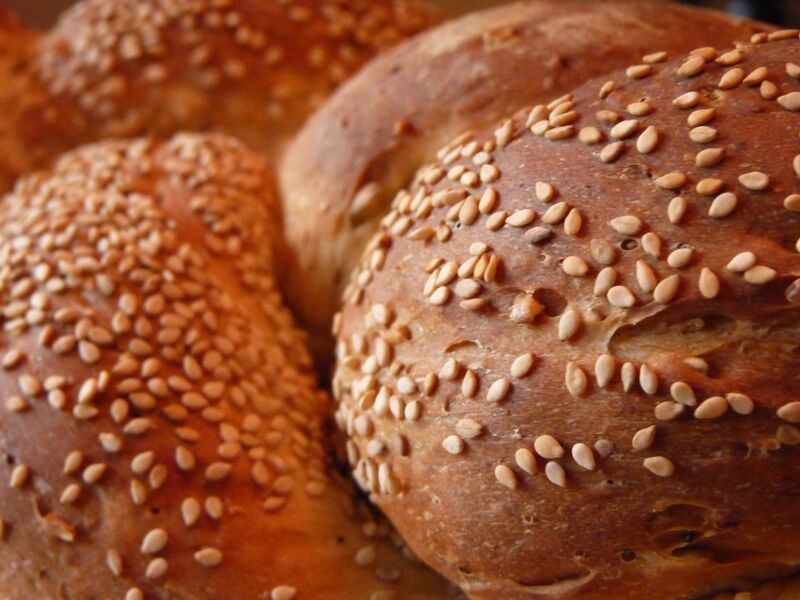 Give the Crunchy Seed Braid a try, and be sure to see how Michele’s turned out. I’m always up for a new bread recipe, so this week’s recipe for the Tuesdays with Dorie group went on my baking schedule. Cooked, cooled potatoes (I peeled them, but the recipe says to leave the peel on) are mashed and then the rest of the ingredients are added: potato cooking water, yeast, olive oil, salt, and flour. Although the first rise wasn’t as quick as the 20 minutes promised by the recipe, the second rise was quick, and overall, it didn’t take long to make this bread. 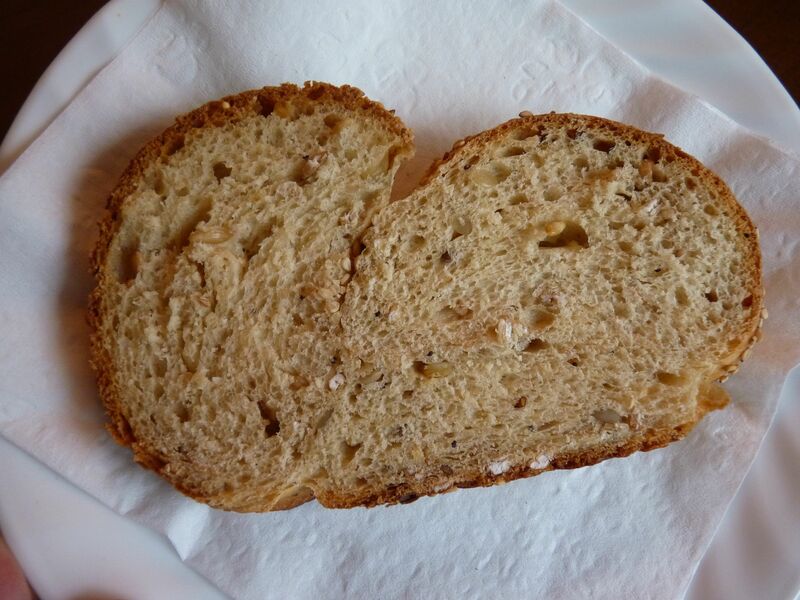 The reward was a soft, tender bread that’s good with or without butter. In fact, this bread was so soft and tender that I wonder if it could be baked in a loaf pan and used as a sandwich bread. Something to think about for next time. The recipe for Rustic Potato Loaves is on page 138 of Baking with Julia, or our host Dawn will have the recipe posted at Simply Sweet. 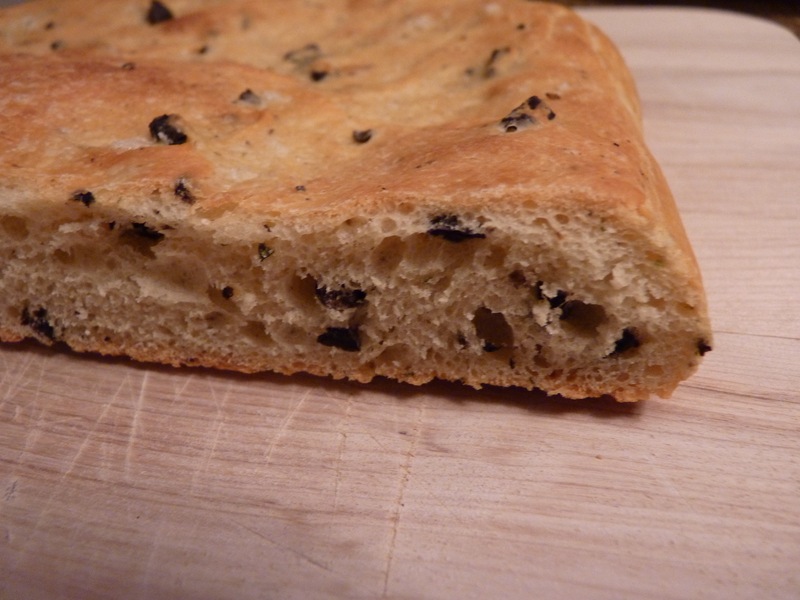 Here’s the deal: this focaccia was good. I topped it with fresh rosemary, black and green olives, and kosher salt. 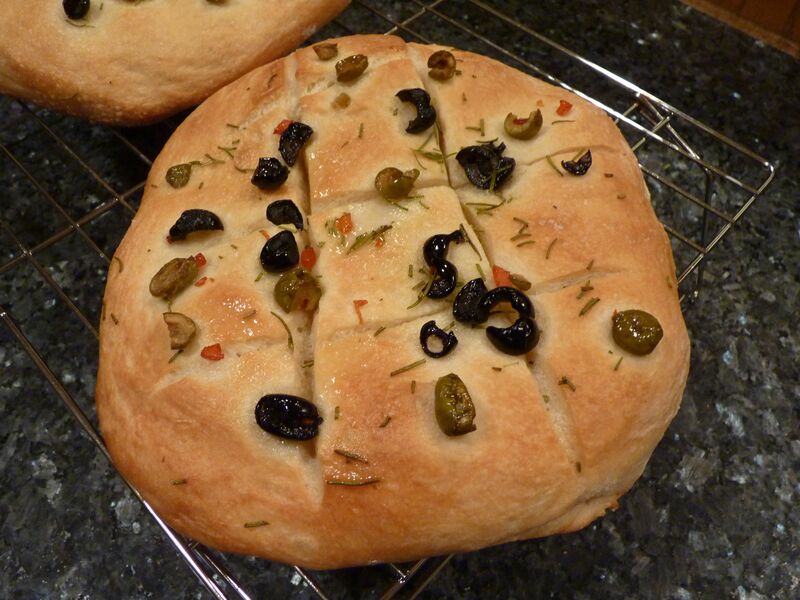 But…just a couple of weeks earlier, I made the focaccia recipe from the Flour cookbook, with the same toppings. It was outstanding; therefore, this recipe had a lot working against it from the get-go. However, I will note that the recipe from Flour has a heck of a lot more olive oil in it, which is probably what makes it tastier, but also makes it much more decadent than an average bread recipe. 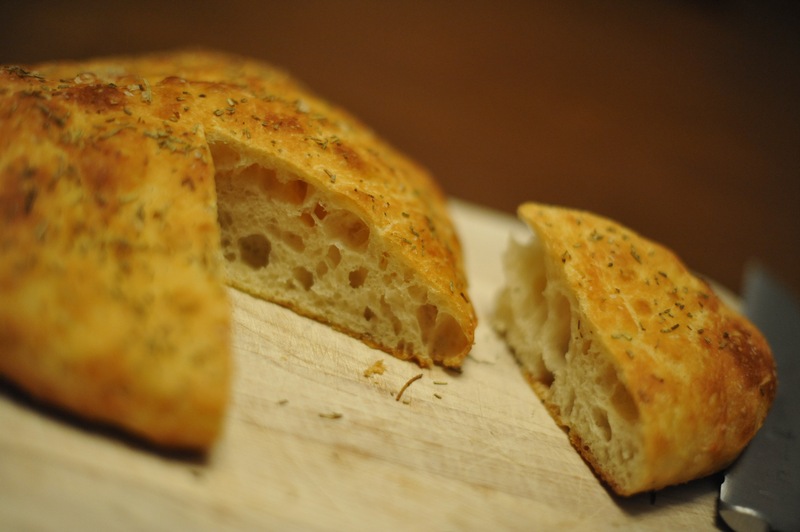 I’d like to have more focaccia in my life, so I’m hoping to find a recipe that’s a happy medium. Perhaps you, too, need more focaccia in your life. This recipe, baked by the Tuesdays with Dorie group this week, is on page 143 of Baking with Julia, or pop over to Wandering Through, where Sharmini will have the recipe posted. You are currently browsing the archives for the Yeast Bread category.